Ricki's plan was simple. Risky, but there was a chance it might work. "Now, at night, you open your window and sneak out, yes?" Tye nodded. "Getting out's not a problem. The issue is getting IN." "Hold your Unis, I'll get there," Ricki replied. "Now, Jack and I can sneak food up here for you. That way, at night you take it to Allehya." "And how do I get back in?" "Come to the servant's cabin and knock four times, pause, then four times again. Jack or I will wait by the door, then you can come through the cabin, and get into your house that way." Tye smiled. "That's brilliant!" she said. Then her face fell. "But like I said, if you get caught…"
"Then we get caught!" Ricki said with unnatural ferocity. "I'm tired of your parents; they don't care about anyone but themselves! As long as they're happy, nothing else matters! It's almost worth getting fired to help someone under their noses!" "Alright," Tye said. "But listen; leave the food business to me. I've got a better idea." A malevolent grin spread over the Ixi's face, and Ricki had to smile. Tye began the plan at lunch. She ate her peanut butter and lettuce sandwich, while her family had salads. Afterwards, she went to the sink, where Ricki was scrubbing out a pot. With a wink, Tye grabbed another sponge, and pulled a greasy pan from the sink. She scrubbed it, making sure to bang the pan against the metal sink, and to drop the sponge in the water with an exaggerated splash every few minutes. By the time she finished that pan, the rest of the family had stopped eating, and were staring at her. Tye pulled a large blue bowl full of stains from popcorn butter out of the sink. She made as much noise with the bowl as she had the pan, until her father stood and roared, "For Coltzan's sake, what are you DOING?" Tye turned and gave him a puzzled look. "I thought you said I was supposed to do the dishes until next month. From last night…?" Her father looked confused as well. "I didn't say that!" "Yes, you did," Tye insisted, hoping her sisters would do what she and Ricki had anticipated. Sure enough, Jeralyn said suddenly, "Oh, yes, Father! I remember you did! Didn't he say that, Ellen?" Ellen blinked, but only for a second, "Yes, you did! I remember that!" "I really don't remember that…" For a moment, Tye was afraid her father would mess up the plan. But then he said, "Well, then, we'll leave you with the dishes. Come on, ladies; it's almost time for the performance." And the whole family got up from the table and headed out the door. "Ricki, see that she does do these dishes and gets back up to her room by the time we get back from the play," Tye's father instructed before he let the kitchen door close behind him. The Bori and Ixi waited until the door had slammed shut, then gave each other a high five. Tye dashed upstairs, and grabbed a knapsack from beneath her bed. Running downstairs, she saw that Ricki had gathered some apples, a few loaves of bread, and two big bottles of water for Allehya. Jack was at the sink, putting the last of the dishes in the strainer to dry. Tye whistled as Jack turned and dried his hands. "How'd you do that so fast?" she demanded. Jack smiled. "Don't use the sponge. Use those bath brushes." He pocketed one of the rough, blue horn cleaners into his pocket, and winked. With a chuckle, Tye set the knapsack on the table, and loaded it with the food and water. She heaved the pack back to her room, and returned downstairs. "You guys need help with the chores?" she asked. As much as she loved books, Tye didn't plan on sitting around reading all day. She was too worried about what she was going to do that night. So Tye spent the rest of the day scrubbing floors, polishing furniture, and doing laundry. About ten minutes before her parents got home, around ten at night, Tye slipped upstairs, and set up her room so that it looked as though she'd been reading all afternoon. Tye sat on the bed, flipping through the pages of "Draik Legends". It was almost one in the morning by the time the house was quiet and dark. The Ixi moved as stealthily as she could, slowly setting her hooves on the wood floor, dragging the heavy bag of food with her teeth. She opened the door, which Ricki had left unlocked, and slipped down the stairs and out the front door. It was cold that night. Summer was reaching an end, and fall breezes were beginning to crop up. Kreludor's pale light filled the street with a silvery glow. Tye moved quickly, keen to get back home, out of the cold. As it turned out, Tye didn't need to worry about getting back in the house that night. She found Allehya's alleyway, and looked around for the shadow Kougra. She found her on the roof of a nearby building, gold bracelets gleaming in the light of a small candle Tye assumed was Allehya's. She was watching something behind the tidy row of houses of Gold Palace Road, and across the street of those houses. 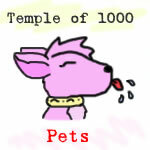 That area was considered a bad neighborhood, home to some of the fiercest alley pets in Neopia Central. There was a large wire fence surrounding Gold Palace for this reason. The only way to get in and out was to show ID to the burly watch Gelert at the gate. Tye clambered up a stack of wooden boxes to join Allehya on the roof. Unlike the Kougra, Tye had little traction on the rooftop. "What's going on?" Tye whispered, giving Allehya a questioning look. The Kougra replied, "Something's going on over there. I heard smashing glass a moment ago, then saw this group of pets heading that way." Allehya pointed toward a group of dilapidated buildings scrunched onto the corner. "They went inside a few minutes ago. A Kougra, and I think two Kaus." "A break in?" Tye suggested. Allehya frowned. "That part of town's got nothing to rob. Just a bunch of houses and a pawnshop. A little place for hotdogs and stuff, too, but that place doesn't reap profits." "How'd you know that?" Tye asked. "I lived there for a while. Not too long, 'cause somebody's always attacking you, stealing your food and shelter." "Should we check it out?" "No way! If we got caught in the bad neighborhood-" Just then, a bright yellow light flashed on. Tye blinked and jumped back. She slipped off the roof, and landed in the pile of boxes. Some shattered, others just fell. The bright light illuminated Allehya, whose eyes had gone wide. "Kougra! Halt!" The voice had come from what sounded like a bullhorn. It was deep and angry. Allehya crouched and bared her teeth. A skinny purple Techo entered the alleyway, nightstick drawn. Judging by his badge, the Techo was a police officer. He stepped past the boxes Tye was half buried in, and leapt onto the roof. Tye heard him say, "Now, put your paws up! You're under arrest." "For breaking into the store in the neighborhood, stray!" The Techo's official, oily manner dropped as quickly as Tye had from the roof. "Now, PUT YOUR PAWS UP!" "But I didn't break in! It was-"
"I said put your paws up!" "GET YOUR PAWS IN THE AIR!" "You'll have to catch me first!" the Kougra roared. There was a loud swish as she jumped, and the thump of the Techo's nightstick. Allehya darted past the boxes, and Tye struggled out from beneath a crate marked "Dung Jelly Delivery". Tye gave the box a strong, adrenaline pumped kick, and the box of dung jelly flew through the air. The Techo cop had just leapt from the roof, and the box hit his head with a loud CRRRACK! The Techo roared as the contents of the box slid down his uniform. Trying to take a step forward, he slipped on the jelly, and fell on his back with a loud grunt of surprise. Tye scrambled to her hooves, and raced out of the alley, dodging the smelly mess. She heard the sound of fast moving paws to the left. Tye started to head that way, then stopped. With a groan, she ran back into the alley, and grabbed the knapsack from the pile of broken boxes. She darted out of the alley, and went left. It suddenly occurred to Tye that going left down this stretch of road meant heading to the gate. How would Allehya get by the guard without having to show an ID? And what if the Techo cop got out of the dung? If he alerted the Gelert to Allehya's arrest, the stray Kougra would be stuck in the subdivision forever. Well, not forever. The cops wouldn't have much trouble capturing her. And from what Tye had heard, none of them would listen to an alley pet. Tye screeched to a sudden stop. The tall gate loomed ahead, threateningly spiked at the top. Sure enough, an enormous shadow Lupe was standing by the gate. He looked bored, but not tired. Tye crept into a nearby alley, moving slowly so her hooves wouldn't make a noise on the sidewalk. She almost jumped when a furry paw pulled her farther in. Tye whirled around, and saw, to her relief, Allehya silhouetted in the feeble moonlight. "Do you know how to get past that gate?" Allehya whispered. Tye nodded. "You need an official ID. My parents have one, but I don't." "Think we could climb it?" "Are you nuts? We'd be stabbed to death!" "Maybe not." Allehya pointed to a place on the far right of the fence. "The spike there was removed 'cause it got rusty. But nobody ever replaced it. I think we could use the building there to climb through that area, and get out!" "Okay," Tye said, trying to appear as though the fact that a five-inch gap being the only way out wasn't a problem. "Now, how're we gonna get the guard on this side of the fence?" Allehya grinned. Picking up two rocks, she said, "C'mon. I'll show you." Using the fire escape, the Kougra and Ixi snuck to the roof of the building. With a fierce grin, Allehya lifted one of the stones in her paw, drew her arm back, and threw. THUNK- CLANG! The rock disappeared into an opposite alley, and had slammed into a trash can. The Lupe jumped, and opened the gate. He slammed it behind him, then ran into the alleyway. "Let's go!" Allehya ran to the side of the roof by the gate, crouched, and leapt. She cleared the fence, and landed smoothly on the other side. "Toss the bag!" Allehya called. Tye blinked, then remembered that she still had the knapsack of food and water. With a heave, she tossed it to Allehya. The Kougra caught it, then called, "Your turn!" "HOLD IT RIGHT THERE!" The Lupe had emerged from the alley, and was darting up the fire escape stairs. Tye stepped back, then leapt. She felt the iron fence touch her stomach fur, but then she was over! She landed on all fours, but slipped and cut her right leg. Scrambling to her feet, Tye ran after Allehya, who had grabbed the bag's drawstring and started running. The shadow Lupe ran to the edge of the roof in time to see the bushes of the nearby forest rustling from the passage of the odd team, a scrawny stray and a well bred rich pet.